The primary goal of the National Hurricane Conference is to improve hurricane preparedness, response, recovery and mitigation in order to save lives and property in the United States and the tropical islands of the Caribbean and Pacific. In addition, the conference serves as a national forum for federal, state and local officials to exchange ideas and recommend new policies to improve Emergency Management. The aim of SAOS is to provide a stage for researchers, engineers, academicians as well as industrial professionals from all over the world to present their research results and development activities in Atmospheric and Oceanic Sciences. SAOS 2019 will be a valuable and important platform for inspiring international and interdisciplinary exchange at the forefront of Atmospheric and Oceanic Sciences. Commission for Water Sustainability of the International Geographical Union (IGU) invites you to the conference Water sustainability in a changing world, 11th - 14th June 2019, in Bucharest, Romania. Ongoing global climate change, population growth, urban sprawl, land use modification and rapid development of economic activities are some of the most relevant facets of the transformations affecting our planet in the last decades, with significant impacts on water resources. These changes have led to alterations of the quantitative, qualitative and ecological features of the aquatic environment, threatening the sustainability of water resources. Meanwhile, extreme hydrological events, which appear to have increased in frequency and magnitude, have caused noteworthy human, economic and environmental damages, sometimes catastrophic. AMOS is pleased to announce that the AMOS Annual Meeting will be combined with an International Conference on Tropical Meteorology and Oceanography (AMOS-ICTMO 2019). This event will take place at the Darwin Convention Centre from 11-15 June 2019, Darwin Australia. This joint CIWEM-BHS national meeting (part of an ongoing series of meetings designed to link researchers, policy makers and practitioners) will provide an excellent opportunity to learn more about the value that hydrometry provides for society, the environment and the economy. It will feature presentations and debate from those responsible for the collection and management of hydrometric data, through those who utilise it for studies, modelling and critical decision making, to the less obvious users who gain value from it. The National Centre for Atmospheric Science and the Royal Meteorological Society are jointly hosting the 2-day UK Atmospheric Science Conference in Birmingham on 2-3 July 2019. The meeting will provide a unique opportunity to bring together atmospheric scientists with interests in weather, climate and atmospheric chemistry to present latest research findings. The Student and Early Career Scientists Annual conference provides an excellent opportunity for Masters, Undergraduate and PhD students, as well as early career scientists, working in fields related to meteorology to present their work in a friendly environment. ICAER 2019 is sponsored by the Hong Kong Chemical, Biological & Environmental Engineering Society (CBEES). 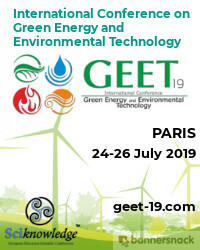 It is one of the leading international conferences for presenting novel and fundamental advances in the fields of Advances in Environment Research. It also serves to foster communication among researchers and practitioners working in a wide variety of scientific areas with a common interest in improving Advances in Environment Research related techniques. As in the recent publication of the IPCC AR5 report, flood risks have been again highlighted as one of the most perceivable indicators when it comes to the understanding of climate change impact. Research on flood risk has never been ampler, yet we still witness the growing causalities of severe flooding around globe on a yearly basis. The stark resemblance of the consequences between the two catastrophic flooding events in both Japan and Indonesia 2018, exposes a bitter reality that there are still knowledge gaps where both the academia and the practitioners need to fill, with no exception for even the developed world. Continuing from the successful series of previous IMA Conferences on Flood Risk, the IMA is planning its 4th International Conference on this topic in 2019 to bring together engineers, mathematicians and statisticians working in the field. The conference intends to be used as a forum for participants to meet and exchange their views on important technical issues, new and emerging methods and technologies in assessing flood risks in a world that is being altered by the climate change and moving towards an uncertain future. The emphasis will be on new developments in mathematical modelling methods, statistical techniques in assessing flood risks, especially on quantification of flood risks with a nonstationary climate and modelling uncertainty. Methods and application of assimilating new data from cutting-edge new type of observations will be among the topics for discussion. The conference will be of interest to flood defence practitioners; flood defence managers; statisticians, mathematicians, civil engineers. American Meteorological Society (AMS) committee on Radar Meteorology and Local Organizing Committee in Japan welcome academics from a broad range of disciplines, including radar technologies, numerical model, satellite remote sensing, hydrology, signal processing, and atmospheric science on any aspect related to radar meteorology. This conference merges up to three unique satellite conferences into one major event. It has been the practice of the American Meteorological Society (AMS) Satellite Meteorology, Oceanography, and Climatology (SatMetOC) Committee (organizers of the 23rd AMS Satellite Meteorology, Oceanography and Climatology Conference) and the European Organisation for the Exploitation of Meteorological Satellites (EUMETSAT; organizers of the 2019 EUMETSAT Meteorological Satellite Conference) to hold joint conferences approximately every six years, most recently in Vienna (2013), and previously in Amsterdam (2007) and Paris (1998). The event is co-organized by the AMS Committee on Satellite Meteorology, Oceanography, and Climatology, EUMETSAT, and NOAA and hosted by the American Meteorological Society. The conference will provide an opportunity to discuss mainstreaming nuclear power as a low carbon energy source and its role in combating climate change. The mathematics of climate change is one of the grand challenges of 21st century. Atmospheric phenomena range from large scale monsoons and jet stream meanders with spatial scales of thousands of km’s and time-scales of months to years all the way down to individual cumulus clouds formed by turbulence with spatial scales of 100 meters and time-scales of minutes. This workshop will help develop the mathematics necessary to advance our understanding of how to efficiently and accurately link these physical processes. Improvements in this "physics-dynamics" coupling is the major obstacle to improved accuracy of climate models. We are pleased to announce the 2020 Sun-Climate Symposium, which is sponsored by the Sun-Climate Research Center, a joint venture between NASA GSFC and LASP at the University of Colorado. The format for this symposium consists of invited and contributed oral and poster presentations in several themed sessions. We encourage your participation and hope that you will share this announcement with colleagues. 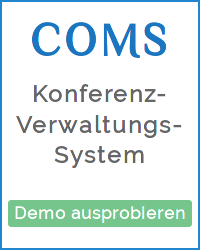 Conference-Service.com stellt der Öffentlichkeit ein Kalendarium wichtiger Konferenzen, Symposien und sonstiger Tagungen im wissenschaftlich-technischen Bereich zur Verfügung. Obwohl das Verzeichnis mit großer Sorgfalt zusammengestellt und ständig aktualisiert wird, weisen wir auf die Möglichkeit von Fehlern ausdrücklich hin. Bitte vergewissern Sie sich immer beim Veranstalter, bevor Sie über die Teilnahme oder Nichtteilnahme an einer Konferenz entscheiden. Organisatoren können kostenlos ihre Konferenzankündigungen veröffentlichen.